Summary: I'm Trella. I'm a scrub. A nobody. OOHHH this book sounds fantabulous !!!!! The book trailer to this made it seem so intriguing. I want! I have been waiting forever to read this! Hahaha, I almost bought this at the book store. Well, maybe I'll win it! *wipes drool* I pretty much stalk this author and will read anything she writes~! I heard about this book!!! You've got some great options up for grabs today! Please enter me-I am so excited to read this! This is on my wishlist and I really want to read it! Maria V. Snyder has been one of my favorites ever since Poison Study! Sounds fun, please enter me. I've been hearing good things about this one. Please, enter me! I can't wait to read this! Please count me in! I want this book so much. I have this on my list to read! 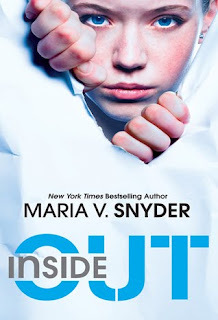 I love Maria V. Snyder's previous works and would love to win a copy of INSIDE OUT! Sooooooo excited to read this!! Heard so much about this book! I want this book so so much! Please enter me for this one too, thanks! throw my name in hat, please!! I've heard a lot about this book! I've being seeing a lot of great reviews for this "World in a box" Please count me in! Please enter me for this awesome book! I love this author. Can't wait to read this one. I love Maria's books. I can't wait to read this one. This book sounds good! I likey the cover too! 2 winners too~ Awesome! Another interesting book, please enter me. This dystopia looks great! Please enter me. omg, i love this author! Snyder is awesome! Please enter me in the contest! Ooh this looks really interesting. Enter me please! I'd like to enter for this one, please! On my wishlist! Thanks for entry. Sounds fantastic. I'd love to enter. This one looks super interesting to me. Definitely count me in! This book sounds fantastic!